A diamond ring from The One is as unique as you. This 9 carat white gold ring is set with a centre stone, surrounded by a halo of diamonds in an intricately designed setting featuring round cut diamonds. The diamonds set in this ring total 1/4 carat in weight. Every ring comes with a diamond passport showing the journey of your individual diamond, from the original rough diamond to the finished stone. A unique ID number is inscribed on each individual diamond guaranteeing its quality and each diamond comes with a GSI certificate showing its colour, clarity, carat and cut. 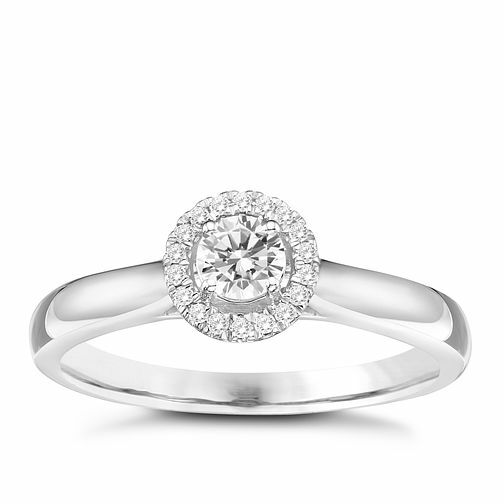 The One 9ct White Gold 1/4ct Diamond Ring is rated 5.0 out of 5 by 3. Rated 5 out of 5 by Anonymous from Photo doesn’t do it justice It’s a Beautiful ring, my fiancèe loves it! I was lucky enough to get it on sale too.